And so it begins. My succumbing. I have resisted for over two years, or longer. It’s been a tug of war between my rheumatologist and me. I am the first to admit, I am not the most compliant of patients. I didn’t like what the literature had to say about these drugs and I chose to abstain, after consuming them sporadically for a few years. His one complaint about me, to my hearing at least, is that I read too much. But, I believe your health care is a compact between you and your doctor. I’m sure a lot of that has to do with my being a nurse. I always saw doctors and nurses working in partnership, in tandem, though they didn’t see that way for the most part. Now this particular war is over. My bone density test wasn’t pretty. Wasn’t exactly earth-shattering, excuse the partial pun, but it’s come time to grit my teeth and swallow. I don’t even know what he ordered. If it’s something I have to take once a week, or once a month, or . . . never? I just know it’s ready and waiting because my pharmacy texted me before I even reached home from his office. “Irma, your order is available for pickup.” Shouldn’t that be ‘pick up’? Two words? Digital-age surprise awaits me tomorrow. A little pharmaceutical gift. Another modern medicine marvel to join the ones that already make themselves at home in my medicine curio. One positive in all this is that Prednisone gets kicked to the curb. Or I should say, gently eased to the curb. It doesn’t like any rough stuff, but as it likes to eat bone, it’s got to go. We might have to add another ingredient to my RA cocktail to replace what benefit I derived from it, but time will tell what and when. I can’t complain, though. The other thing he says about me after every visit is: You’re doing very well. I suppose everything is relative. To him. But, I do feel a little askew. 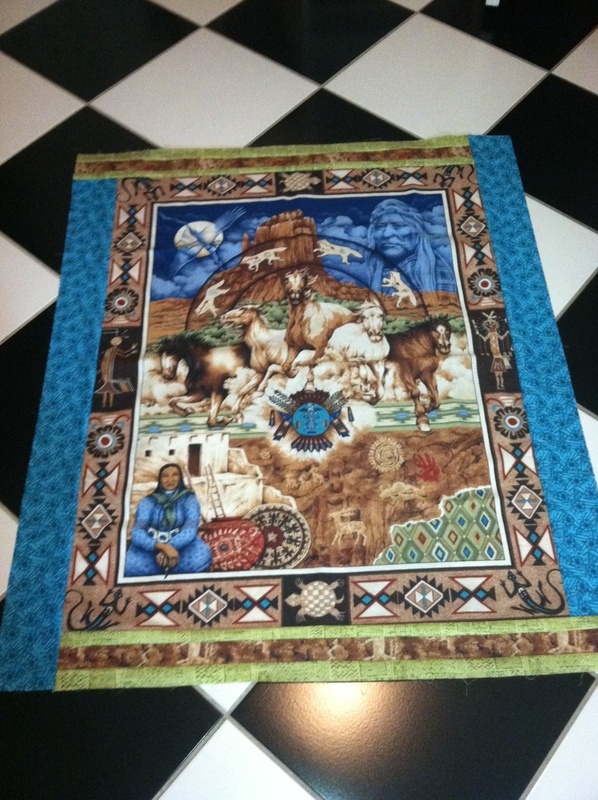 And maybe that’s why I subconsciously chose to place the borders to my panel quilt off-kilter last night. This entry was posted in Blogging, Health, Life, Quilting and tagged Bone density, Choices, Health, Osteoporosis, Prednisone, Reality on July 24, 2013 by Irma. Irma, I like the borders that way. The quilt is beautiful! I’ve been taking Fosamax for osteoporosis for two years, now. I was a little nervous about it, initially–the side effects can be scary. But so far, so good. I take it every Sunday morning, first thing, and wait a half-hour before taking my other meds, drinking coffee and eating breakfast. I think the wait is the hardest part of taking the stuff! Heheheh… gotta find something to complain about, you know? I’ll be having another bone scan sometime before the end of the year, I think, so I’ll know then if the Fosamax is working and whether it’s been worth the risk. I hope your worry turns out to be over nothing, too. Hi, Wren. Thank you. I’ve got two days to finish the quilt! Talk about self-imposed pressure. I took Fosamax also for several years, hit and miss. But now, I’ve got a tooth that needs work and the dentist says do it before you start back on that type of drug. So back to the dentist, I go. I was surprised that after all this travel my CRP was only a few points elevated, but I might have to attribute my fatigue, aches and pains afterwards to plain old aging!